This narrated tour of San Francisco sights — including Golden Gate Park, Haight-Ashbury, and the Presidio — continues on a scenic drive across the Golden Gate Bridge. Wander among the coastal redwoods of Muir Woods National Monument and take in the views from Sausalito's picturesque waterfront. Round-trip hotel transport is provided. After hotel pickup in San Francisco, you'll take a comprehensive small-group tour around the City by the Bay. Listen to narration on board while you pass by points of interest at Union Square, the Financial District, Chinatown, North Beach, Lombard Street, Twin Peaks (weather permitting), Golden Gate Park, Haight-Ashbury, the Embarcadero, Pier 39, Fisherman's Wharf, the Marina, Palace of Fine Arts, the Presidio, and Fort Point. Then take a scenic drive across the Golden Gate Bridge to explore the natural wonders of Muir Woods. Learn about these coastal redwoods at the Visitor Center and meander the well-marked trails independently. Re-board your tour vehicle for the lovely waterfront town of Sausalito. 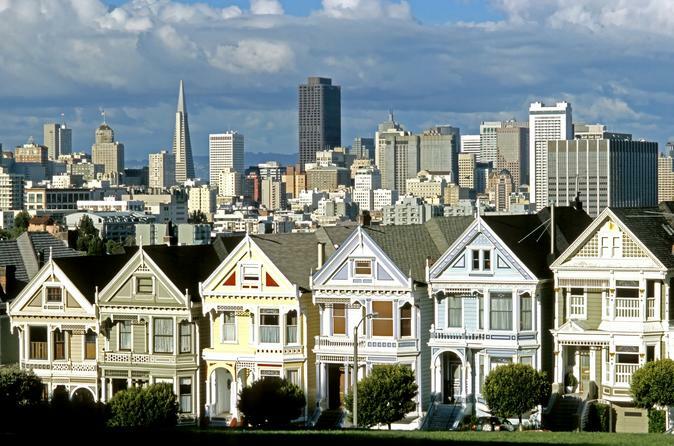 Appreciate its outstanding views across San Francisco Bay and spend free time browsing the art galleries, boutiques, and eateries before returning to your hotel in San Francisco.